Princess loves the color gold, like a true princess. 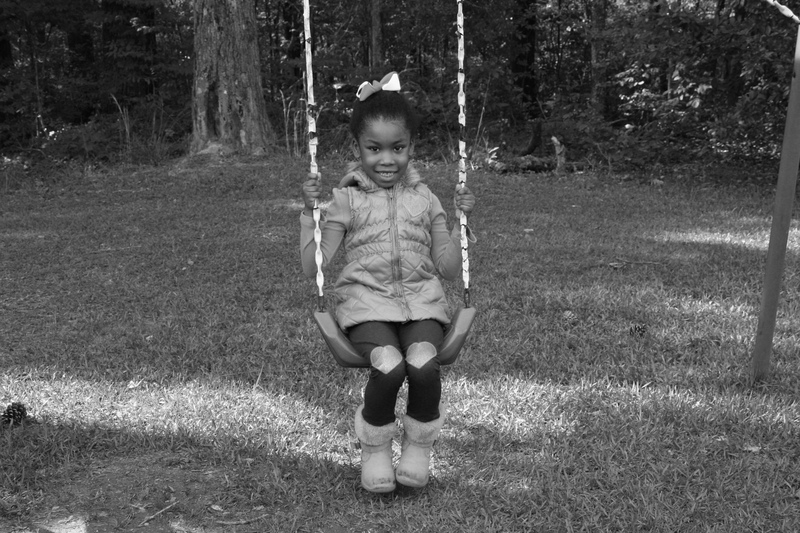 She enjoys playing with other children and especially loves to swing outside. It’s no surprise that her favorite T.V. character is Doc McStuffins because she wants to be a doctor when she grows up. Princess has a very tenacious personality for a girl her age. She will certainly be a great leader one day! Princess would love to have a family to call her own. Could she be the next addition to your family? We are a home study ready family from western NY and would like to learn more about Princess. Please contact Erica Jones (DCFS Adoption specialist) for more information on Princess. 318-362-3361. Hi Ms. Jones. Yes, as far as I know she is still available. Please contact Erica Jones (DCFS Adoption specialist) for more information on Princess. 318-362-3361. Hi! Thanks so much for your interest in Princess. Yes, as far as I know she is still available. Please contact Erica Jones (DCFS Adoption specialist) for more information on Princess. 318-362-3361. Hello, my family currently lives in Texas and are in the final stages to receive our adoption license through a local agency in Abilene, Texas. We are a family with 2 boys and would like to adopt a little girl and Princess could be the next addition to our family. Please let me know what information that you need from us to further inquire about Princess and InterState adoption options. Hi! Thanks so much for your interest. Congrats on receiving your adoption license! Please contact Erica Jones (DCFS Adoption specialist) for more information on Princess and what the process for interstate adoptions would be. 318-362-3361. Hi! Please contact Erica Jones (DCFS Adoption specialist) for more information on Princess. 318-362-3361. How would I go about getting more information about Princess? Hi Ms. Young. For any more information on Princess, you would need to contact her Adoption worker. As the Heart Gallery we don’t have any additional information. Please contact Erica Jones (DCFS Adoption specialist) for more information on Princess. 318-362-3361. Good afternoon. Happy Tuesday!!! We just read Princess’ profile and we are eager to learn more about this little girl who’s already displaying qualities of a leader. We would love to discuss her status and basic information with you. We are home study approved (located in the state of Virginia). We, my husband and I are very hopeful that we’ll be in contact and discuss the possibilities. Looking forward to hearing from you. Thank you for your time and attention and consideration. Hi! Thanks so much for your interest in Princess. As The Heart Gallery, I don’t have any additional information, but you could certainly contact her Adoption worker to find out more information. Please contact Erica Jones (DCFS Adoption specialist) for more information on Princess. 318-362-3361. Hi Ms. Ross. Yes, as far as I know she is still available. Please contact Erica Jones (DCFS Adoption specialist) for more information on Princess. 318-362-3361. Hi Ms. Jones. Please contact Erica Jones (DCFS Adoption specialist) for more information on Princess and more information about inter-state adoptions. 318-362-3361. We are interested in submitting our home study for Princess. Hi Ms. Jones. As I know she is still available. Please contact Erica Jones (DCFS Adoption specialist) for more information on Princess. 318-362-3361. Good afternoon. How are he/she are doing? My name is Latika Coleman. I am in the process of going through the Foster to Adopt Class in Thiboduax, LA. I have chosen to partake in both. Preferably, I would love to adopt. I have to attend the next class session in August. I have came across this beautiful angel. Do you know how long has she been awaiting for a permanent home? I know that I have to become certified. Hi Ms. Coleman. I do not know how long she has been waiting for a home. As far as I know she is still available. Please contact Erica Jones (DCFS Adoption specialist) for more information on Princess. 318-362-3361. I would love to know more about Princess!!! My husband and I are working with Bethany Christian Services and would like to adopt. Please contact Erica Jones (DCFS Adoption specialist) for more information on Princess and the process to become an adoptive resource. 318-362-3361.
can she leave the state? Please contact Erica Jones (DCFS Adoption specialist) for more information on Princess and information about inter-state adoptions. 318-362-3361. Hi Ms. Patterson. Yes, as far as I know she is still available. Please contact Erica Jones (DCFS Adoption specialist) for more information on Princess and the adoption process. 318-362-3361. Is Princess still available for adoption? Yes, as far as I know she is still available. Please contact Erica Jones (DCFS Adoption specialist) for more information on Princess. 318-362-3361. We are a home study ready adoptive family and are interested in learning more about princess. How does one inquire about Princess? Where would I have my caseworker send my homestudy? She is very beautiful, is she still up for adoption? My husband and I are searching for a daughter. We have two sons, ages 7 and 3. We would love to know more about Princess! We have an approved home study as of 8-1-18. PRINCESS IS A BEUTIFUL CHILD. COULD YOU TELL ME A LITTLE MORE ABOUT THIS PRECIOUS CHILD? As the Heart Gallery, we do not have anymore information other that what is posted. Her adoption worker will have the most up to date information. Please contact Erica Jones (DCFS Adoption specialist) for more information on Princess. 318-362-3361. Hello, My name is Helen N. Potter. My husband and I are interested in learning more about Princess. Please contact us at the email listed below. As The Heart Gallery, we can not advise you on what the process for adoption is. Please contact Erica Jones (DCFS Adoption specialist) for more information on Princess and how to become an adoptive resource for her. 318-362-3361. I would like to know more about Princess if she has not been adopted.